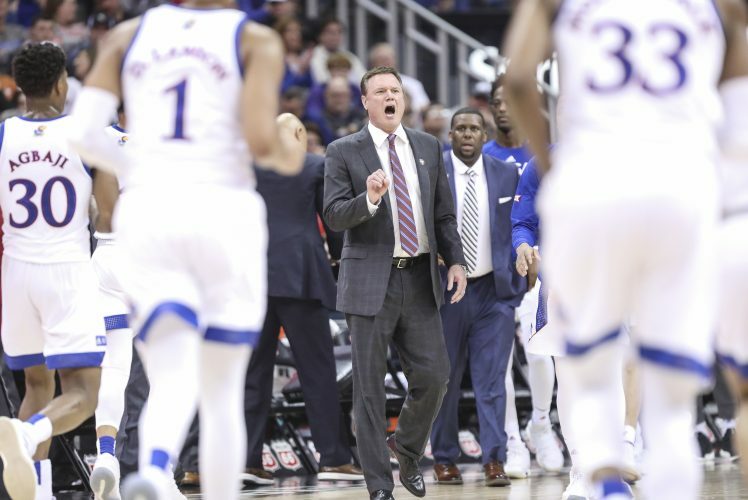 Kansas coach Bill Self calls to his players during the second half of an NCAA college basketball game against Texas, Saturday, Feb. 25, 2017, in Austin, Texas. 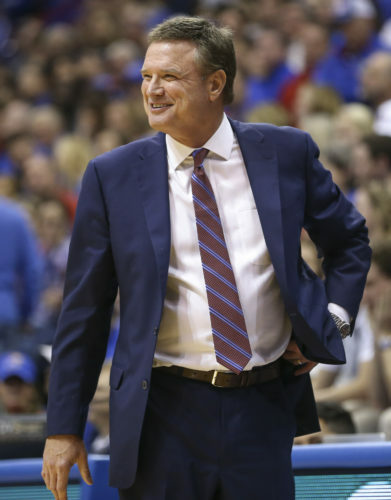 Kansas won 77-67. 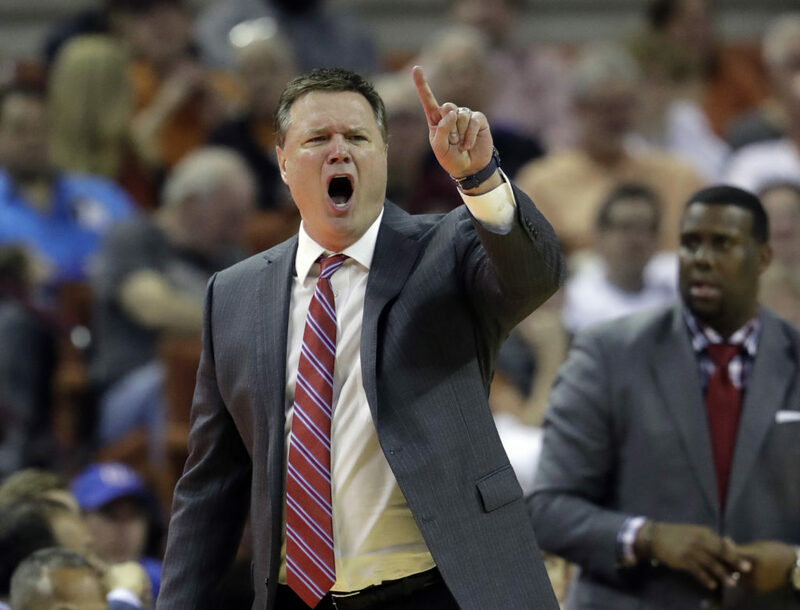 News broke Monday that Kansas earned the distinction as preseason No. 1 in the Associated Press men’s college basketball poll. Under normal circumstances, that would trigger peacock struts from Mass Street to campus to the West side of town. It might spark conversations here and there as to whether this adds pressure to the season, but those would be drowned out by festive, relentless boasting. Instead, the air feels more like that reserved for the days following KU’s final loss in the NCAA tournament. 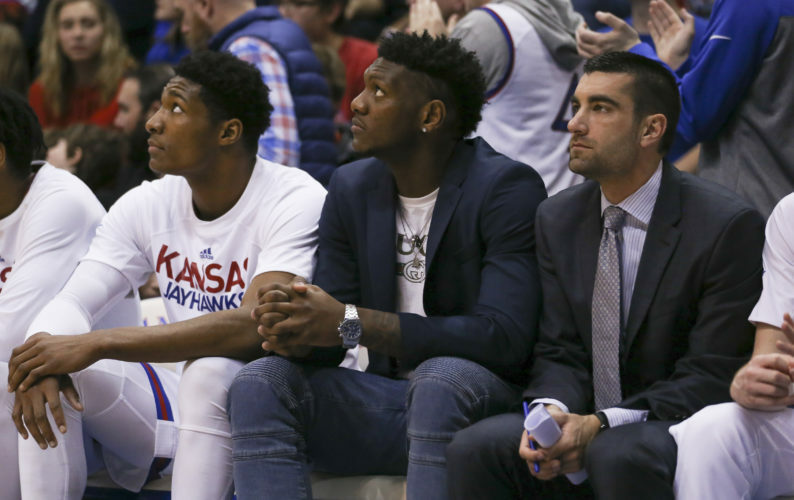 The embarrassing revelations during the federal trial regarding corruption in college basketball have cast a palpable pall over Lawrence. Kansas wasn’t on trial, but the same can’t be said for its apparel partner, Adidas. The jury on that federal case was in deliberations when news of KU’s No. 1 ranking was released. The aftershock of the former overwhelmed the positive vibes of the latter. In the court of public opinion, no jury with a formal ruling was needed. 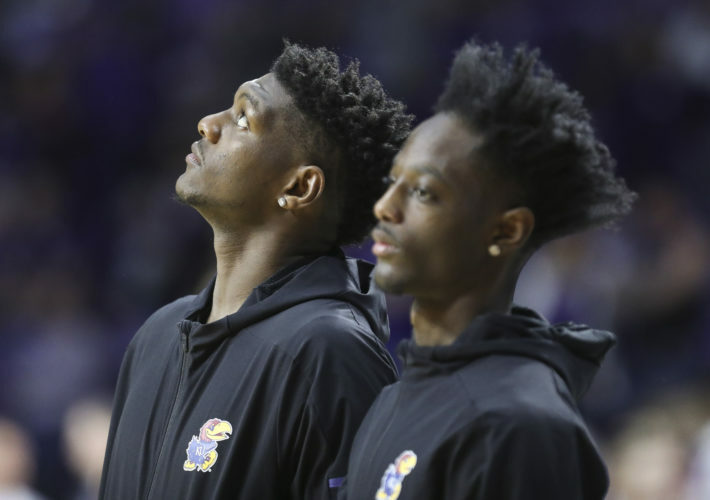 Even if it never is proven and even if the NCAA doesn’t come down hard on Kansas for anything, the majority of those paying attention can’t help but reach the conclusion that Adidas and Kansas acted in concert to steer Billy Preston and Silvio De Sousa to Allen Fieldhouse. That, of course, leads to reasonable speculation that those are merely the most recent players and far from the only ones to travel that gilded path to Kansas. And that’s a tough place for the mind to go for a sports fan, by definition a greedy sort. It’s not enough to have a team that goes at least as far as the Elite Eight more often than not. That team also has to be the one that doesn’t bend the rules, much less break them, and has players far nicer than the rest of the blue bloods. No loyalty is quite so blind as that of a college sports fan. “Why does everybody say that?” I counter. “Since Cal was at Memphis and still at Kentucky, tons of recruits had both Self and Calipari as their final choices. Some pick Calipari. Others Self. Are you saying the ones who want to get paid go to Kentucky and the ones who don’t want to get paid go to Kansas? And others pick Duke, coached by Mike Krzyzewski, the sport’s paragon of purity. Everybody knows that. If the lighting’s just right, I swear you can spot a halo above Coach K’s black-as-night hair. One such player, Zion Williamson, picked Duke over Kansas, Kentucky, Arizona, Baylor and others. Interestingly, the Williamson recruitment was the source of the greatest embarrassment for KU to come out in court. Again, the player ended up at Duke, not Kansas, so what is the NCAA supposed to do with that one? 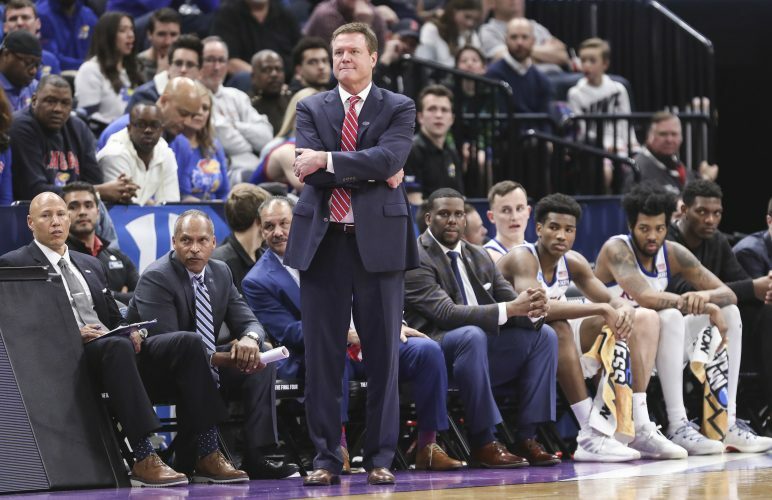 It’s easy to picture a Duke fan stuck in the Bermuda-grass rough at a course on Tobacco Road blasting KU basketball, grousing that he doesn’t like Self because he cheats. In instances such as these, assistant coaches have been known to pay the price with their jobs. I don’t see that here. I can’t see Self using one of his closest friends and most valuable team members as his shield. That’s not in his character. And I don’t see Kansas even pondering cutting ties with Self, the university’s biggest rock star. Suspensions? Sure, that’s possible. Terminations? Would you want to try to find a replacement for Self, knowing full well that wherever you turn you will settle on a coach with less impressive abilities as a motivator, in-game tactician, recruiter and smiling ambassador for the university? Besides, to do so would be to guarantee declining revenues. In what business is that acceptable? Follow the money.